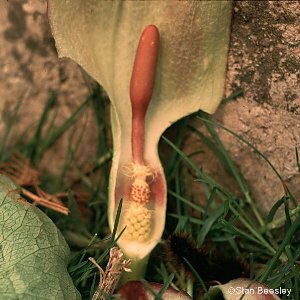 This is a species with a multiplicity of English names, "cuckoo-pint" and "lords and ladies" being probably the most familiar today. Many of the names (including these two) are of a sexual and improper nature when judged by today's rather delicate standards! Others, such as "parson-in-the-pulpit" have more innocent associations. The plant has a complex procedure for ensuring cross-fertilisation. The functional male and female flowers are concealed within the hollow chamber at the base of the inflorescence. This chamber traps and imprisons flies which pick up pollen from the male flowers and carry it to the female flowers of different individual plants. In late summer and autumn the flowers are replaced by the fruits - scarlet juicy berries, mildly poisonous, carried in groups on the flower stalks. 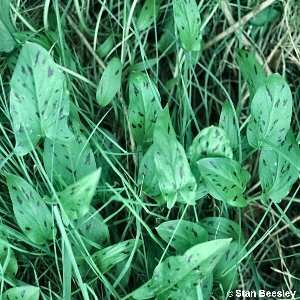 The leaves are arrow-shaped and appear in spring before the inflorescences. The roots were a traditional source of starch for stiffening clothes, collars and Elizabethan ruffs. Common in woodland and shady hedgebanks. 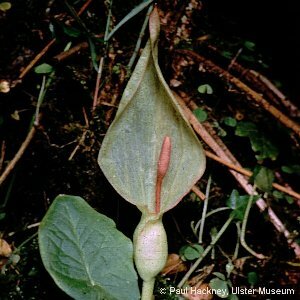 All names: Arum maculatum L.